Scientific name: Elaeagnus angustifolia L.
History: Russian olive is a native plant to Eurasia and introduced in the US in the early 1900's. It was introduced first as a horticulture plant because people were unaware of the negative impacts that it could have. When it was planted thought it would be pest free in north America because all its native pests had remained in Eurasia. Although, 100 years after the first tree was planted, a fungus disease was discovered in north America that killed the branches and ultimately killed the tree in the end. The fungus disease does not seem to be a large problem for those who want to keep their Russian olive trees nor is it a good control for those who want to get rid of their Russian olive trees. Roots: The roots of Russian olive can grow very deep extending to depths of 40 feet underground. In the roots there are nitrogen-fixing bacteria that allow Russian olive to grow on bare mineral substrate. Stems and Leaves: The twigs of Russian olive are often skinny and flexible, coated with a gray scaly like substance with a thorn on the end. The bark towards the base of the tree is reddish-brown in color and very thin. When the bark is peeled off, is usually comes off in long narrow strips. The leaves of Russian olive are linear with a light green and gray color. They range in size from 1.7 to 3.5 inches long. The leaves also are covered with a scale-like substance giving it a silvery appearance. Flowers and seeds: Russian olive flowers from May to July and has yellow flowers arranged in clusters. It also produces a small oval shape, brownish-red fruit that matures from August through October. Seeds are small and brown and are produced after the tree is four to five years old. Seeds can remain viable in the soil seed bank for three years. Methods of Reproduction: Russian olive reproduces primarily by seed, although it also sprouts from buds at the root crown and suckers from lateral roots can occur. Environments favorable for infestation: Russian olive prefers areas where the water table is near the soil surface such as in riparian zones, flood plains, and valley bottoms. It commonly grows near water tanks, irrigation ditches, and springs; along roads, railways, and fence lines; and in sub-irrigated pastures and grasslands. Russian olive can survive in dry environments so has long been planted as windrows and wildlife cover throughout north America. Environmental impacts: Russian olive is problematic in the Southwest because it favors riparian communities and other moist environments. 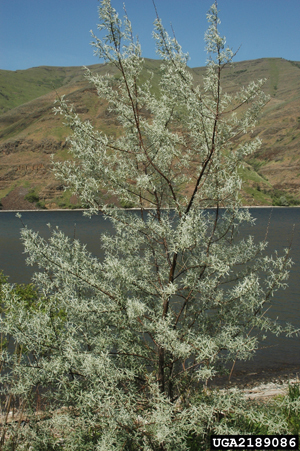 As populations increase, Russian olive crowds out desirable native riparian trees such as cottonwood and willow. Because of its ability to colonize stream banks, Russian olive can alter the natural flooding regime and reduce availability of nutrients and moisture. Range: Russian Olive is widespread throughout the United States and is considered a noxious weed in New Mexico. In Montana it is left up to the individual county to classify it as a noxious weed or not. Prevention: It is hard to prevent the seeds from spreading but, one way you can prevent Russian olive from growing is by not planting any new trees for windrows or cover. Mechanical: Mowing saplings close to the ground with a brush mower helps keep them from sprouting into new trees. Also, you can hand remove the trees by digging them up or tearing them out of the ground with a tractor or backhoe. Biological: Currently there is no bio-control insect for Russian olive. Although, well trained goats will selectively graze on Russian olive seedlings and young trees.